Includes copy of Acid Pro 8.0 to get you started! Capture drum recordings without a kit! 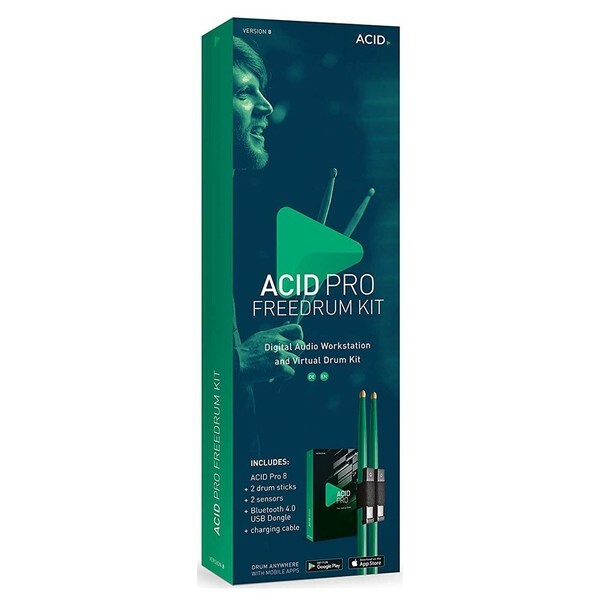 The Magix ACID Pro 8 Freedrum Kit is a revolutionary new way to play and interact with drum sounds. The Magix Freedrum Kit allows you to jam, record and play drums without the need for a kit. It works by having sensors attached to the sticks, providing six hit zones to give you an authentic playing experience. The precise tracking provides realistic feedback for all the drums, with near zero-latency accuracy. You can even jam on the move using your smartphone device. The Magix ACID Pro 8 Freedrum Kit is specially designed for use with Acid Pro. The kit comes complete with 9GB of ACID loops and samples to get you started straight away. When inspiration strikes, just drum. 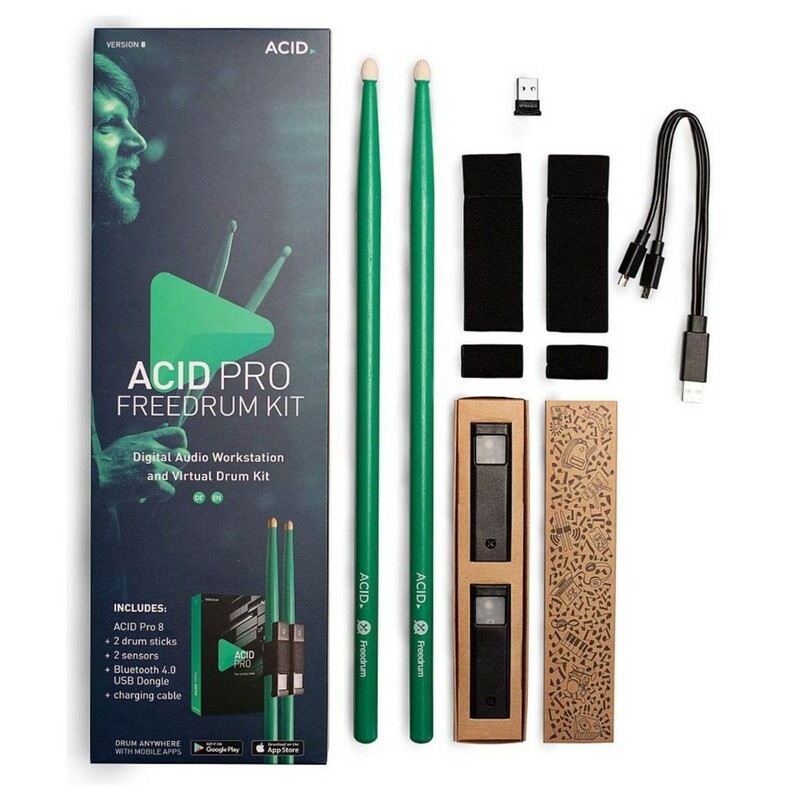 The Freedrum kit offers total control over your drum section without the need for a kit. Record incredible grooves in ACID pro as if you were sat at a drum kit. Simply connect any drum sticks to your computer using the USB Bluetooth dongles. Open ACID pro and then start drumming away. Using the vast array of sounds that Magix provide, you'll always find something to fit the vibe you're feeling. Perfect for the studio, excellent for on the road. The tracking on the Freedrum kit is incredibly accurate. This helps you get your ideas down accurately. There are six hit areas that give you an authentic feeling of playing on a full kit. The feedback on the sticks is very realistic too, you can change the velocity of your playing to affect accenting. And with the twist gestures, you'll be able to control things like open and closed hats and rim shots. Start something special. ACID pro has been on top of the game when it comes to loop-based music creation. Version 8 of this software offers you a wide variety of tools to create the music you want to. With 64 bit technology under the hood, you can expect fast processing speeds no matter how many instruments you use. The modern interface is intuitive and offers up complete control over your musical projects. Unlock your creativity and turn the ideas in your head into a reality. ACID pro has a lot of features that make it an attractive DAW. The multitrack recording offers 24-bit 192kHz fidelity and the 64-bit engine works brilliantly with your PC to bring maximum power and efficiency to your craft. Once your song is arranged the way you want it, the superior mixing tools of ACID Pro 8 allow for total control over multiple mixing parameters. And with all the synths and instruments you'd ever need, ACID Pro 8 is the consummate DAW for today's producer. Play drums without the need for a kit!